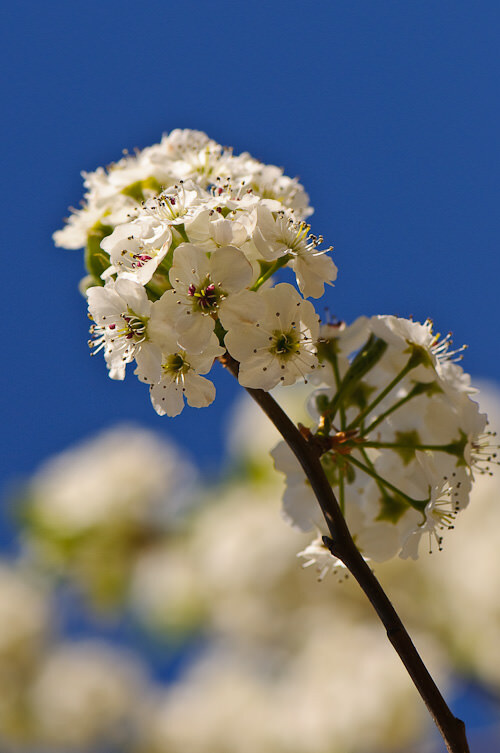 Home » Photography Tutorials » What is Bokeh? 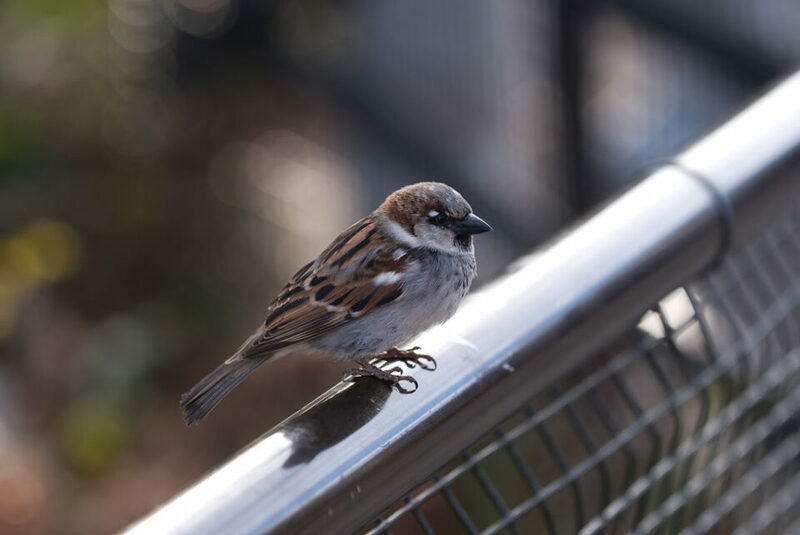 The house sparrow is in focus and sharp (which means that it is inside the depth of field), while the background is out of focus (which means that the background is outside the depth of field). 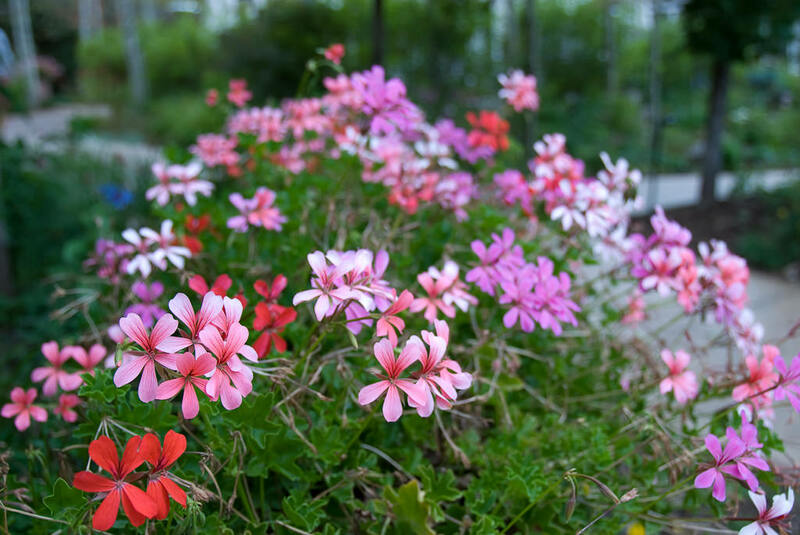 The small or “shallow” depth of field is the result of standing relatively close to the subject, while using a large aperture. See those round circles of different color on the left side of the image? Those are light reflections and they are circular because that’s how the lens rendered them. In this case, the soft “feel” of those circular areas is what photographers would call “good bokeh”. While some photographers argue that bokeh is just about the quality of the circular light reflections, many others, including myself, believe that bokeh is about the quality of the entire out-of-focus area, not just reflections and highlights.. Remember, bokeh is rendered by the lens, not the camera. Different lenses render bokeh differently due to unique optical designs. Generally, portrait and telephoto lenses with large maximum apertures yield more pleasant-looking bokeh than cheaper consumer zoom lenses. For example, the Nikon 85mm f/1.4D lens produces exceptionally good-looking bokeh, while the Nikon 18-135mm f/3.5-5.6G DX lens produces poor bokeh at the same focal length and aperture – all due to differences in optical designs of both lenses. Again, I am not just talking about the background blur; all lenses are capable of producing out of focus blur, but not all lenses are capable of rendering beautiful bokeh. Pay attention to the smooth background behind the child’s face. The out-of-focus areas look creamy and the circles are round and soft with beautiful transitions between the blurry areas. That’s exactly what you would call good bokeh! Open up the larger version of the above image and see for yourself – the quality of the blur is not pleasant to the eye, with sharp edges of the circles and double lines. So, how do you get a good bokeh in your images? As I have pointed out above, bokeh depends on the type of lens you are using. 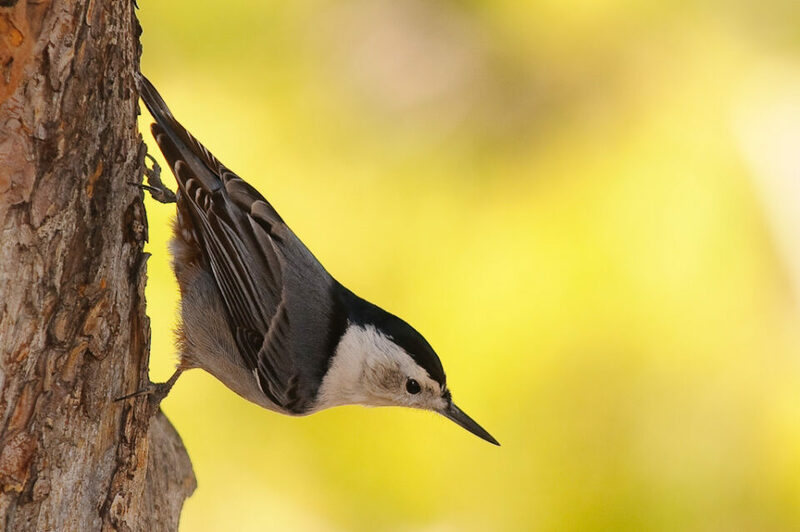 While lower-end consumer zoom lenses will yield unpleasant bokeh, fixed (prime) lenses and most professional zoom lenses with fast apertures yield good-looking bokeh. Do you know if your lens produces good bokeh? Try this: focus on an object from a very close distance (as close as the lens will allow, keeping the object in focus), making sure that there are no objects at least 5-6 feet behind it. Make sure to be on the same level as the object itself, so that you are not looking down on it. Do not use a plain wall as your background – try to find a colorful background, preferably with some lights on it. A Christmas tree is a perfect background for a bokeh test. 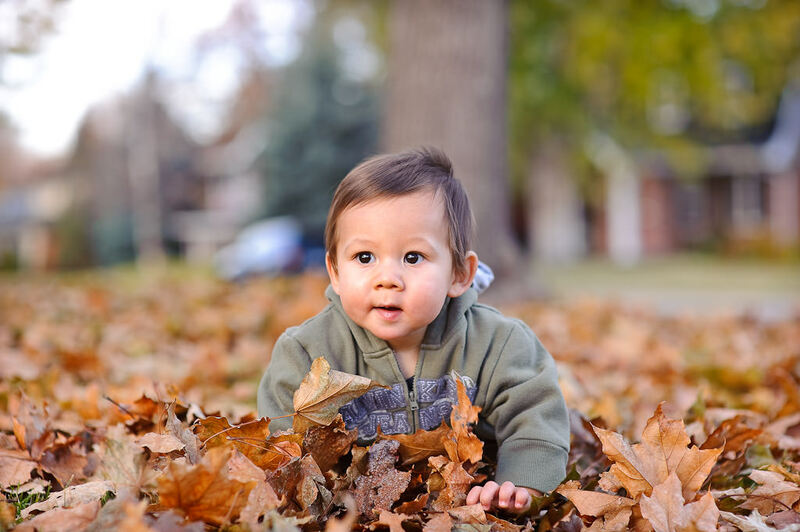 Once you find a good test subject with a suitable background, set your camera to “Aperture Priority” mode and set your aperture to the lowest number. On most consumer zoom lenses, the lowest aperture is typically f/3.5, while on prime and professional zoom lenses, it can be between f/1.2 and f/2.8. Once the aperture is set to the lowest value, take a picture of your subject and take a look at the rear LCD of your camera. The subject should be in focus, while the background is blurred. 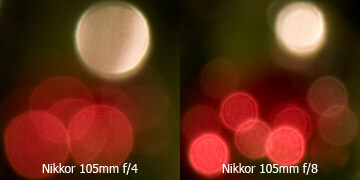 If you have a good lens, the bokeh should be soft and fuzzy, looking pleasing to the eye as shown in the example above. The circular reflections should be round and soft, with no hard edges. 5) What Lenses Create Great Bokeh? 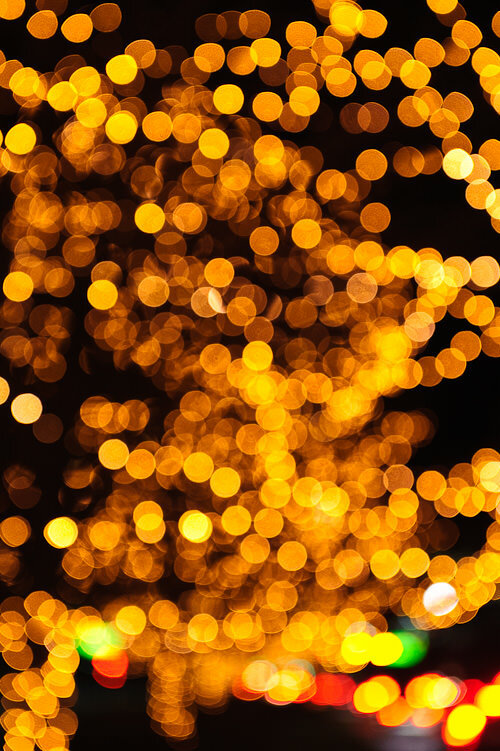 There are many lenses that create great-looking bokeh. Most fast prime lenses with round-blade apertures such as Nikon 85mm f/1.4G or Canon 85mm f/1.2 II USM create exceptionally good-looking bokeh. The lower-cost version of the same lens – Nikon 85mm f/1.8G and Canon 85mm f/1.8 USM also produce beautiful bokeh. There are too many lenses to list, so I recommend doing some more research on different lenses, based on your photography needs. I am just a budding photographer (as you might be knowing by now), and want to buy a good camera and lens…. Appreciate your suggestions… Btb, I am in denver, colorado.. Thanks. Vasan, thank you for stopping by and dropping a comment! The Nikon D90 is an excellent camera, I’m sure you will love it. i’m using D3000..can’t u tell me how to get good bokeh ? F-ara, bokeh largely depends on the lens. You need a good portrait lens like 35mm f/1.8G or 50mm f/1.4G to get good bokeh…kit lenses with large apertures typically don’t yield good-looking bokeh. does canon 50mm lens also create good bokeh? Now I’m thinking about Jefferson Airplane. You threw me into a time warp! I’m shooting film with a Canon A-1. I’ve been using Canon’s 50 mm f/1.8 for a number of years. Is that the lens you’re thinking of? I also recently got a 50/1.4 from a second hand store. I’ll have to look into this whole bokeh business some more. Thanks. And thanks to Nasim for the informative article. I have a Conon 50mm 1.8 and I just tried it wide open. Excellent bokeh for about $120. Ninety percent of the reason why the top shots illustrated were good are because even backgrounds that contrast with the subject were chosen. SO with a lower end lens you can still take superb shots with excellent bokeh portraying even dreamy texture, I have. Having the higher end lens simply means that more complex backgrounds that are subject to poor results will come out better and dreamy texture can be finer. The pink flower shot above does have bad bokeh but the photo is rubbish because it focused on the wrong flowers. Having out of focus background flowers destroyed the shot more than poor bokeh. Jaime, thank you for your feedback – Lola and I really appreciate it! Can you recommend a good yet affordable lens in the fuji, four thirds, and sony system? I am about to invest in one of these brands and I have been trying to research this lens for great brokeh. I TOTALLY AGREE! This is the most informative, user friendly blog that I have ever read. I have owned my Nikon D60(yes time for an upgrade) for like 6 years now and haven’t taken but like 20 pictures with it! SHAME ON ME! I haven’t learned how to use it and have been so dang frustrated with it. This blog is heaven sent. Thank you for taking the time to help all of us who aren’t quite as camera smart as you! One question though. I upgraded to a better lens…the 18-200mm.? I would like to know your thoughts on that lens and also your thoughts on my camera. Is my camera even good anymore? I just feel like I can’t ever get a good picture like the ones you have on your blog. Are your pictures all photoshopped? What type of bokeh would we get from a Nikon 18 – 105 mm? Bokeh on 18-105mm is bad when compared to portrait lenses. If you want good bokeh, you need to get something like the Nikon 50mm f/1.4G. THen I suppose that a nikkor 18-55mm standard lens does not produce an “acceptable” bokeh neither, does it? People: Do not get the stock lens…. They are not worth nothing. You might as well stick with your iPhone. I have a Nikon D300. I am wanting to step up in lenses – have the kit lens now. I am shooting my cousin’s wedding in January… late afternoon ceremony, 100+yr old church with very high vaulted ceilings made out of very dark wood, and the windows are stained dark blue. They of course want only the old chandeliers and candle light (have a lightsphere for my flash) They would like outdoor shots after the ceremony as well as inside the church. The church is surrounded by trees, so any sunlight on the horizon will be blocked by the trees. The reception is in a repurposed old barn with halogen overhead lights. I am very much set on the 50mm f/1.4G for most of my work (which is newborns, children, families in mostly natural light);however, if I were to be able to get one more lens @ this point which one would be helpful in the wedding situation? I do have a sb-600. And was considering the 900, though I don’t do a lot a weddings, and only shooting this one because it is my cousin. I have a Gary Fong lightsphere also. In your opinion is the 600 adequate or do I need to go to the expense of the larger flash? Though I will not use it as much as a true wedding photog. or is my money best spent on a lens that I will be able to use in the natural lighting situations I am usually shooting in? Mindie, the SB-600 will work great for indoors shots. Coupled with the Gary Fong lightsphere, you should be able to take some good pictures in challenging light. Don’t forget to bump up your camera ISO and try shooting in TTL mode. And getting the Nikon 50mm f/1.4G will certainly help, since you can lower the aperture and shoot at faster shutter speeds/lower ISO. I am interested in purchasing the Nikon 16-85mm f/3.5-5.6G (with the D300s), would this lens produce a desirable bokeh? Heyy, does the nikon 55-300vr have nice brokeh? Im planning to buy one, but im not sure with the brokeh. thanks. Hill, its bokeh is OK, not as good as in some prime lenses like Nikon 50mm f/1.4G. i am taking a photography class..and am assigned to know more about bokeh… this site helps!! 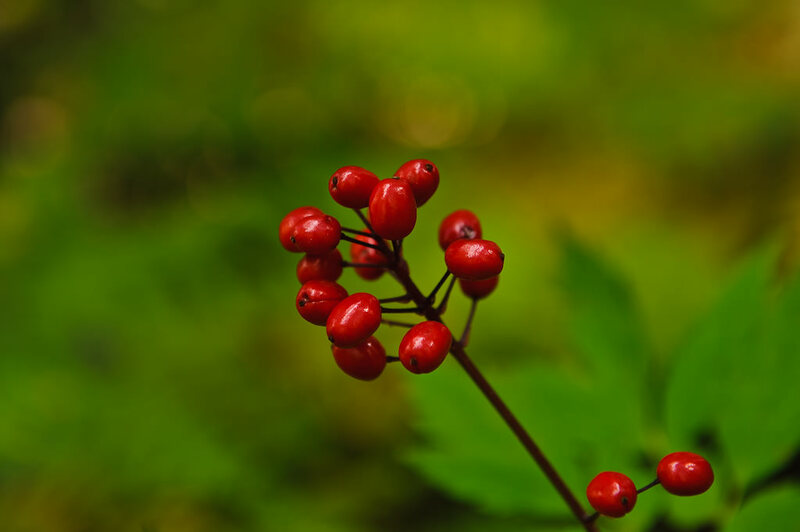 by the way, what is the difference or how to differentiate macro and bokeh images? Syifa, macro usually means close-ups. When you see small bugs enlarged in photos, they are usually shot with a macro lens. Nasim.. Thanks for the wonderful article.. I am in love with your blog ;) Can you please help me with the difference – a macro lens and zoom lens? Are they both different or mean the same.. i.e. if the zoom is higher, then you can take a macro shot with that?? ‘Macro’ is the ability to focus on objects that are Closer than could normally be focussed on with a ‘normal’ (easier to design and cheaper to make) lens of the same focal length in use. In a non-zoom lens this would require that the glass of the lens can be moved further away from the camera’s focal plane that would be possible with a ‘normal’ lens. ‘Zoom’ is the ability to change the Focal Length of a lens. Conceptually then, they have nothing to do with each other. Design and Manufacturing-wise, there is sometimes taken the opportunity to utilise the ability to change the distances between various groups of elements within a zoom lens (essential to enable the focal length to be altered) to also enable the elements to be positioned further away from the focal plane within the camera, such that the Effective image to lens distance is made bigger than would be possible with a (simpler) ‘normal’ (whether zoom or not) lens. This effectively increased image to lens distance will enable the bringing into focus of objects that were previously too far away to be focussed on. Whether or not the design of a Zoom lens is such that it will also enable this different type of rearrangement of the lens groups is not predictable from its zoom focal length range. It would add to the complexity and therefore manufacturing cost of a ‘non-macro’ zoom lens. The ‘macro’ facility is often only provided only at one end of the focal length range of a zoom lens (often the wide angle end). nice topic..thanx for sharing your knowledge. i have a question to you.. just buy d3100 but wondering can i get a good bokeh using the kit lens which is 18-55mm..i know it impossible to get a good bokeh like those picture..as long as this kit lens give a liltle bit bokeh..i think that should be enough to me..since im newbie..really appreciate if you can share your knowledge..
thanx for the answer nasim..really appreciate..ur blog really good..
Nice article. I wonder, you suggest Nikon 50mm f/1.4G for good-looking bokeh for example. Is there any different if I use D or S series instead of G? Is it still produce good bokeh? Hai, I’m using Nikon D90 and just bought 50mm f/1.8D AF. can u tell me how to get a good bokeh using this lense. Do you have any suggestion on the setting using this lense since I can’t shift to any other f except f22 or it will show the FEE error…I really appreciate if you can help me. Great explanation! Now I understand what bokeh is all about. Sometimes when looking at a picture one likes it or not, ignoring the science behind it. thanks! I know that you recommend the 85mm 1.4 for portraits, bokeh and subject isolation. How does the 105mm 2.0 DC compare? Which lens would have better boken and subject isolation? I have heard that the Nikon 105mm 2.0 DC (Defocus Control) lens produces great bokeh. Do you have any experience with this lens. I am trying to determine if the 105mm 2.0 DC or the 85mm 1.4G has better bokeh. Help! Scott, yes, the 105mm DC indeed does produce nice bokeh. However, I personally prefer both the focal length and the bokeh of the new Nikkor 85mm f/1.4G. If you shoot outside all the time and you can get a good deal on the 105mm, then it might be worth considering. Otherwise, I find it too long for my needs. 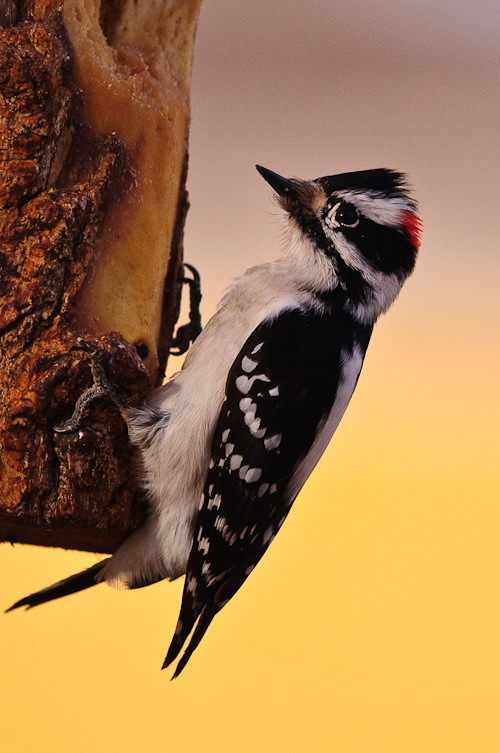 I have enjoyed reading your informative article on shooting birds, and all about the bokeh. You present your ideas very clearly, and I appreciate that. I am a second shooter for beach portraits, and shoot with a Nikon D300. I like using the Nikor 70–200, F2.8 for shooting candids, and would like your opinion on a camera setting preference, such as shutter or aperture priority, for the best possible bokehs. We usually shoot about an hour before sunset. Janis, just shoot aperture priority at f/2.8 and get as close to your subject as possible – you will get beautiful bokeh with your 70-200mm. Thanks for your quick reply, Nasim! I’ll be trying it out this afternoon! Thanx for the article, it was a good learning experience for me. I recently bought a Nikon D3100 and am looking to buy a lens that will get me good bokeh, without breaking my bank. I was considering buying “Nikon AF-S NIKKOR 50mm f/1.8G” but since u said sometimes zoom lenses can yield fairly good bokeh so do u think about the “Sigma 70-300mm F/4-5.6 DG Macro” or “Tamron AF 70-300mm F/4-5.6 Di LD Macro”. As these will also get me flexible zoom with macro options. Since budget is limited, which of these do u think will get better bokeh ?? Sandip, I would get the 50mm f/1.8G instead of any long zoom like the Sigma 70-300mm if you are looking for a good portrait lens. As for macro, neither one of these is good. The Nikon 105mm f/2.8G VR is a good macro lens. Hello, i just bough a nikon d90 come with lens kit 18-108 mm its good for bokeh….or what lens should i get..something that afordable this is my hobby thank you for helping..
Jasmine, no, the 18-105mm lens does not have good bokeh. Try a standard lens like the Nikon 50mm f/1.8G – it will be a world better than your 18-105mm. Lenses with beautiful bokeh like the 85mm f/1.4G are normally very expensive (over $1500). Sandip, that’s a nice pic of your cat! Yes, the 50mm rocks! dear sir,really it was very useful all ur information on this subject ‘bokeh’. let ur infos may bring new photgraphy lovers with inspiration and gratitude. Hey I have heard abt bokeh but didnt know what it was……this is an excillent article…. I am just 16 and very passionate abt photography!! I have a nikon d90 with a 18 to 108mm vr lense…could u pls guide me on how to take a photograph with a good bokeh!! Thank you!! What is the difference between a Nikon 50mm f/1.8G and a Nikon 50mm f/1.4G? im going through reading all that you have to offer here, what a great site! glad to have found it… Wondering if you can help me decide on what lense to go with I love the sharp(but rounded) bokeh your talking about. I am buying a lense mostly for running after children to take great portraits of them through their life. I have a Canon, but I have noticed you use a Nikon,but I have been looking at the sigma 18-50mm f/2.8-4.5 would you say this is a good choice? But Im also thinking of going without a zoom(50mm f/1.4) to make the camera smaller to take anywhere with me. Do you think I would miss that zoom like crazy? nd last question… do you know if the circles on the sigma lense are hexagons or soft circles like you just taught me to appreciate so very much. Thanks for sharing your great knowledge, what a gift you have. What is the best way to have the clear focus on the subject? I am using a canon ef 50mm f/1.8 lens. Somehow my shots are still getting some blur around the edge, and not as crisp as I though it would be. I am very pleased with your work, I am in Hyderabad city in India. I love to photograph birds, I find it that pics are not as sharp as expected. Who is it who is forcing you to read this? I suggest you report them to the authorities. Not having come across Bokeh by name before, I am finding it not only very interesting , but also very useful. (Apart from the repeated posting – we all make mistakes). Maybe you would find it more ‘rewarding’ to be watching Big Brother on TV or something like that? I have recently purchased 2 Nikkor lenses ,1 VR 30 -110 mm f/3.8 5.6 and another AF_S DX VR Zoom 55 -200 mm f/- 5.6G IF -ED and i have Nikon D 90 camera (with AF_S DX VR 18 -105 mm 1.35- 5.6G -ED lense). Pl let me know whether the new lenses are good ones and the price is reasonable ( i have paid US $ 265.00 for both the lenses). Thanks in anticipation of an early reply. This site is of great help. I have a question, I have a Nikon D90 for almost 2 years now. Was shooting the pics mostly on auto, recently have understood the manual functions. Have the stock lens 18-105MM lens. I have a friend who is a photographer and uses Canon Mark III 5D. What I have noticed is, Nikon has sharper pictures and Canon pictures are really colorful. I am planning to change to Canon 7D just because of the amazing color rendering it has. Please do check out WSSA on facebook or and please let me know if the same results can be achieved with Nikon or D90 ? Also, is there any long range lens for Nikon(probably upto 200-300MM with which we can achieve nice Bokah)? I like mostly photographing people(is that known as portrait photography)? Please do let me know about this, as I am really very confused…. Adeel, you can’t be serious about switching to another brand just because you think it has better colors? There is no such thing – you can make whatever colors you want. It is all about how you post-process your images. Focus on your photography, not your gear. As for your lens question, I have plenty of articles that talk about lenses – do some research and you will find your answer. Excellent article help me alot in understanding some basics….. This is a really good site. I am addicted to this site. Will be reading and making notes from this site for many days to come. I am quite sure will become a gr8 photographer. P.S. I had been using my Nikon D3000 for the past one year in the auto mode. Finally decided to learn photography and draw all power of my gear. Got this site in gr8 timing. It is indeed a great pleasure to know you. i have learnt so many things about the photography today, i still got a long way to go. But i am sure i ll learn a lot from your blog here. I am totally new to Photography, recently bought a canon 55od 18-55mm lens. I am Chef by profession & want to create a niche for myself in “Food Photography” as a passion. I would like to know that 50mm/f.1.8 is a decent lens to create a Bokeh? dont want spend much on the lenses now! Your articles are wonderful and really help alot for beginners like me. I have a Canon 550D T2i, i love to take pictures of my kids but like you mentioned they keep moving & the image is very blurry. Can you please suggest me what setting to use to avoid this. You mentioned that we should be on Aperture mode keeping it to the lowest & adjust the shutter speed & ISO on the lowest if possible. Also i would like to know which lense is good to buy, i have 18-55mm & 70- 250mm. Am looking for a macro lense as well so that i get good Bokeh image. Hi, i am new to the portrait world but am loving my new DSLR 3100 Nikon! I have the 18-55mm stock lens it came with, but i take alot of distant sports picts and would like to buy a good zoom lens that is going to give me good results. My son plays football and wrestles and my husband plays softball, so i am taking distant sports shots. Could you give me a good suggestion of a zoom lens to buy? i am looking at the 55-300 f/4.5-5.6g or the 70-300mm f/4.0-5.6g any help would be great. thanks. Really informative writeup. Is there any other article where you have mentioned the best settings for portraits with good bokeh? I have a f1.8 35mm prime lens for my sony alpha 200 camera, but not able to get creamy bokeh. Will using the widest aperture (f1.8 in this case) lead to any compromise in the sharpness or other aspects of the photogrpahs? I heard that lens wont perform at their best if f value is largest or smallest in the range and that there is a sweet spot. Thank You for leading all of us to take better pictures. Do let me know if you plan to come to India. I really liked your article Nasim sir!! I just purchased Nikon D5100 with kit lense 18-55mm. Now as my first lense I am more inclined towards Nikkor 50mm f/1.8D Lens as it cheaper and have wide aperture too. Budget is really my concern. What’s your thought on this lens and bokeh using it? This has no VR, no autofocus. hello nassim, i think i remember reading somewhere that bokeh is the out of focus area in an image and soft circles that appear r not bokeh, they r called circles of confusion, is this true? I have a Pentax K100. I have tried to get bokeh with camera in AV mode & aaperture on f3.5. I can get absolutely no blurring of any kind and am very frustrated. What am i doing wrong??? 1. Get closer to the subject. 2. f/3.5 is not an ideal aperture for bokeh, but still you can get somewhat bokeh from it. All you need to take care is that the distance between the subject and the background should be huge. 3. Use the max focal length available on your lens. Wow, really like this site. A ton of excellent information! I just bought my first DSLR after long hesitation. I used to shoot with a Nikon F601 film camera. The hesitation was mainly driven by the fact that I would need to buy all new lenses and other accessories such as a flash. But man, DSLR camera’s are great (bought the D7000) . Quick question Nasim: just out of curiosity, what lens(es) did you use for the pictures in “6) Other examples of bokeh”? You have made this complex subject so easy to understand. When I initially read about ‘blur’ on wikipedia it frazzled my brain, but you have broen it down with excellent examples and have made it understandable. Great post on boke! I absolutely love the Nikkor 85/1.4G for portraits. I’ve also found the Sigma 50mm/1.4 to produce creamier and rounder boke balls of lightsources than the Nikkor 50mm/1.4, although the focus ring is definitely much more cumbersome for those who like to use manual focus. Thanks again for the great info, you guys are excellent! I am a wedding photographer from Athens, Greece and i love your work and your website. Thanks for very instructive info about bokeh. I admired your nature pictures very much. Evert, nijmegen, nl. This is wonderful! Thank you for posting! I am new to photography and have bought a Nikon D3200 with 18-55 lens. Our baby is due in March and I was wondering which lens would be best for indoor baby portraits with nice bokeh? I have been looking at the nikkor AF-S DX 35mm f1.8G and the nikkor AF-S 50mm 1.8G (apparently fits DX). I was hoping to use the lens in a variety of situations but not sure which would be the better length as I have read that on a DX format body the said lenses equate to approximately 52mm and 75mm respectively. The 35 is slightly cheaper but they are roughly the same price at around £150 ($238). Your article is very informative and excellent for beginners and professionals. I have Canon T4i rebel with 18-135 IS STM lens….I am a beginner in the photography and its my hobby….I am looking for lens for good bokeh….but should not be very costly…. Could you suggest me something better ??? Hi Nasim, I have a Sony A57 with Lentar 135mm f/2.8 lens. I have paired it to the camera using an adapter. Is it possible to get good bokeh with this combination? Since there is no electrical connection between camera and lens, I have to manually focus. I own Nikon Coolpix l820 P & S camera, which I recently bought. I love to shoot nature and so bought this camera for practice. Want to know if my selection of this camera is the right choice. 1. Is it possible for me to take a ‘bokeh’ shot using this camera? > whenever I tried to take a shot of a moving sheet of a big monthly calendar. Please guide me as I am worried if something wrong with my new camera or if I need to correct through some settings. Thanks! I am thinking to purchase nikon 7100d. Is it worth the money or should I spend more on nikon d600? Would Nikon 7100d with a good prime lense deliver as good quality images as nikon d600? Thank you very much for your reply, Nasim! Also do you know if there is difference in image quality when comparing nikon d600 and canon 6d? I read that latest Nikon cameras have better image quality than Canon latest ones. Is it true at all? I own “Nikon Coolpix l820 P & S camera”, which I recently bought. I always got a blurred shot of my kid, EVEN when she was slightly moved. I approached a Nikon dealer to know if something wrong with my camera. He said if I take such moving snaps with FLASH ON, I don’t get such blur. I tried, and yes I am not getting blur shots, great tip he gave..!! BUT not all the shots I can take with FLASH ON right? Sometimes I may even need to take nice natural shots without flash. Please advice me with a TIP to snap the moving subjects without flash with my “Nikon Coolpix l820 P & S camera”. I sometimes worry if those mobile cameras are clever and delivering clear shots than these precise cameras. Hello Mr. Mansurov. I was reading up on Bokeh and came upon your site. I am glad I came. 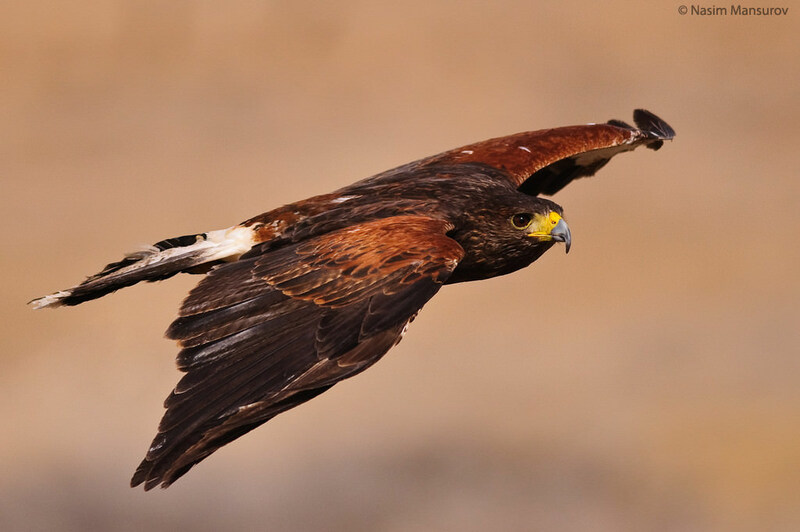 Love all your pictures, especially the ‘Harris’s Hawk in flight photo. I am graduating from a point-and-shoot. I am Interested in buying the Nikon D5200 body and the Nikon AF-S 50mm f/1.8G as my first lens. I am not buying the 18-55mm kit lens. This combination is a bit above my budget so am forced to think about a D3200 + AF-S 50mm f/1.8G instead. The difference in the price of the two combinations is almost US$180 as the D5200 body costs almost 60% more than the D3200 body. Would appreciate if you can clarify a few things for me. 1. Will picture quality differ a lot between the D5200 and the D3200 for the same lens? for example the bokeh effect, if I am using the 50mm f/1.8g. 2. Although I am really interested in photography, I will not be upgrading my camera or investing in really expensive lenses on a regular basis. The thing is I like clicking pictures. Thats all there is to it. So I want to ‘invest’ in a camera which will help me keep on learning for a long time and will also not become obsolete at the drop of a hat. That is why I am confused between the D5200 and the D3200. I know these are silly queries but would appreciate your suggestions. What is the price for Nikon AF-S50mm f/1.8G lens? I am using Canon D1100 with 18-55 lense. Is it possible to take Bokeh with it. And thanks a lot for sharing such good information. The lens I was using said (55-200) on the top, the other lens is (18-55) wasn’t sure which one I should be using for the Bokeh effect…thanks! I don’t have the exact same set-up my 18-55 goes to 3.5 If I move close to them (as close as it will focus, or as close as I can to get everyone in the picture, I get some alright to fair bokeh effect. However, it is not as good even close to being as those pictures shown above. I am going to order a more appropriate lens ASAP, you may need to do the same. Just wanted to say thanks for the information. I have always wanted pictures with everything was in focus. After reading this and looking at the pictures I can completely see what you are talking about. Took some of my own with the kit lenses and did as you suggested. I can see the difference. Now I need to go and find some new glass that will further improve my picture quality. I have the EOS600D and am using the Canon 50mm 1.8 lens. Only just new to this and am trying to obtain max. bokeh. The pictures i take are for sneakers on feet and the aim is the capture the sneaker whilst having creamy blur to the background. Any tips? I need to keep the picture square to fill the Instagram picture space when uploading, and not having any gaps or borders etc. I’m looking to get a Sony Cyber Shot HX300 instead of a DLSR camera since it seems to be more of what I’m looking for in a camera. I’ve considered a Sony A58 or possibly an A65, but I keep coming back to the cyber shot… Can you speak to any such “bridge” cameras and the kind of bokeh I should expect? Should I go for the DLSR? Is Sony a good brand because I really like a lot of their products and most reviews I’ve read on their cameras are positive. I just recently bought myself a Sony Alpha 3000 as I’m just starting to get into better photography too. The included 18-55mm kit lens produces some good bokeh, but after seeing some reviews and example pics, I bought myself a 50mm fixed lens as it had a greater max aperture than the kit lens (model SEL50F18) and the results from this lens are amazing to say the least – much nicer bokeh, though the lack of zoom means I need to position myself for the shot better, but I’m getting used to that now. Learn the manual functions of your camera and behold even better shots with greater depth (bokeh in both the foreground and background). I’m still learning but now the aim is to perfect technique and achieve some great nature shots like shown in this article. is Nikon AF-S DX Nikkor 35mm f/1.8G or Nikon AF-S DX Nikkor 50mm f/1.8G good for bokeh ? 1) D3200 18-105 mm will help me to take blurry image and how to take best blurry image? 2)If not which lens would be better to take blurry image? good day sir… can you give some advice for my d5100 on how to make a good bokeh and I also bought AF-S NIKKOR 50mm 1:1.8g…. Although I’ve been using a SLR for over 40 years, until recently I’d never heard of bokeh. Yet it seems to make its way into articles and conversations more and more. So I google it. And read a bit. This article seems to be a clear explanation of the effect. Thanks. However, like the wine people, called cork sniffers, that painfully detail every perceived undefinable nuance. Or the electric guitar cork sniffers that believe a “tone” only comes from the correct, usually unattainable wood covered in only the thinnest of lacquers that was last available in the 50’s, this bokeh thing seems to be another totally subjective topic that is undefinable, except by the higher price and exclusivity of the lens. Can you please advise how to get Bokeh? I couldn’t agree more, good article, but I would also state the term “bokeh” is really a silly word being used recently for some reason for the venerable terms,” depth of field”, or” depth of focus”, which each lens achieves through it’s focusing on a primary subject, and leaving the others in “circles of confusion”, I never use this term with my students, having taught photo since 1980’s, it being my passion since the 60’s, I countinue to use the term” depth of field”, using the circles of confusion analogy, with a pinhole camera only giving one perfect depth of field since the light coming off the subject is not turned into cones of light needing focus, but stay as straight light rays, therefore all hitting the film plane evenly and being equally in focus. Anyone looking to learn depth of field, get an old film camera, load some film, use the depth of field chart on the lens, read articles on photo prior to 1970, and learn to take an image one at a time, thought out, then move to digital, you’ll find you’ll actually learn the value of what Cartier-Bresson calls “the decisive moment”, the essence of photo. Thanks for the in depth description, it was very useful to see and to know that what I’ve been doing for years has a name. I’ve been in the film and video business for years and the term Bokeh is one i’ve not heard. I have a Canon 5D Mark III with several lenses but prefer the 24-105 f4 that came with it. I’ll look into the Canon 50 mm f/1.8 you suggested. While on a job in Maui took a picture of a King Frog using the 24-105 f4 at night lit only by a walkway lamp, it has become one of my favorite mistakes. I say mistake because I took the picture while walking back from the bar, and couldn’t remember what the settings were that I used to make it look the way it did. I’m familiar with depth of field and that a smaller aperture will give you a sharper overall image and a large opening will give you less depth of field. When you mention the f1.8 it concerns me because each of the lenses I have are f4, will this be tougher in daylight to create Bokeh? P.S. I’ll forward the King frog if you like. The lens length has a lot to do with it, f/4 on a moderate telephoto i.e 100mm-180 will still give you poor depth of field, also the distance from your subject, hence that’s why “street photographers” love wide-angle lenses 28mm or so with their great natural built in depth of field, it’s really simple when you think about it the light rays have to travel less distance to the film plane or sensor, hence hitting more at a point thus creating greater sharpness of image, as you get a longer length the distance to travel is more, thus making focusing more critical to get on of the cones of light to hit at a point. What would be the best way to send it to you? I have Nikon D5100 with 55-300mm lense how can i create good bokeh with this combination ….? please help me with this …….! Your articles are very nice and thanks for the same.. I have Nikon D3000. I feel comfort in Pass port size photos. However I want to improve myself and now have an idea to go for either Nikon D-90 or Nikon D-5300.. Awesome explanation of Bokeh and examples to help. Professionals like you help more than you know! Im currently looking into taking my hobby into something more and im looking at a potential portrait lens for my nikon d5200. Im toying between the 50mm f/1.4g or the 85mm f/1.8g (as im not made of money,,,unfortunatley). bokeh looks awesome in both, any advice would be much appreciated?! How can I get bokeh with my nikon d5200 18-55mm lens ?? I have the same camera and lens. here is a picture I took, set on apature mode f/stop to 4.5 and manual focus,. 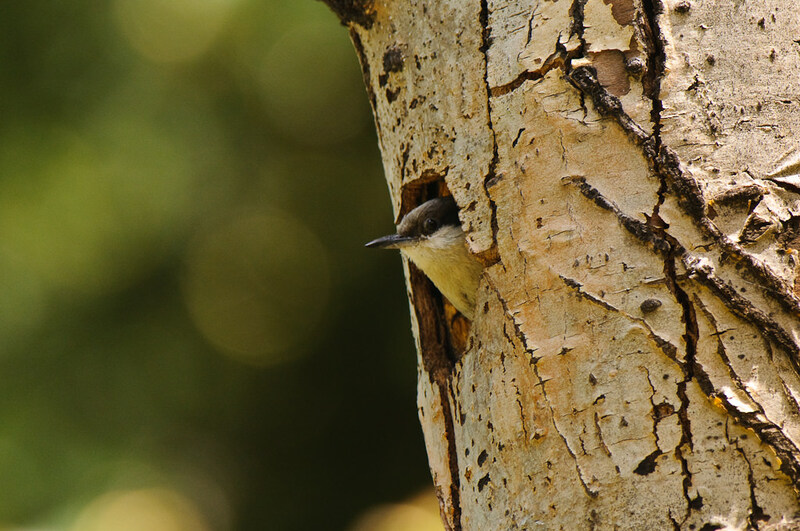 Practice practice practice….our camera is capable of amazing things.. I was content with my nikon d5300 + 18-140 VR lens. I didn’t give any thought to the corresponding aperture numbers. I didn’t even give a second thought to whether i had beautiful or ugly bokeh. This article has changed me forever. Great learning place. Everyone talks about their Nikons but I have the Sony Alpha A-57. I like the camera but need a prime lens. Which lenses do you recommend I try? The 18-55 doesn’t cut it any more. I love composing my photos in the camera, thus like the convenience of a zoom. Also, would you please clue me in to some wide-angle zooms that still will render good ‘bokeh’? Seems like NASIM MANSUROV is mostly a Nikon guy. I have all Canon gear and still dont know why. However, the articles are so explicit that someone just picking up a camera can excel in minutes. I myself have learned so much within minutes of finding Photographylife. I’m writing a blog post for our local online paper. Can I use the baby image and if so let me know the photo credit? Came across the word ‘bokeh’ many times while going through lens reviews but never went into details of it. Today came across this article and think understood many concepts. I have following questions about it. camera model also. Is there any technical reason for that? * Article says shape of bokeh depends on number and shape of blades in lens. Here again shape of bokeh is relative ? Means someone may like hex bokeh and other will like round ? Thanks again for this nice article. Thanks for this amazing article i will share it with other photographers too. Thanks so much for this article. I had no idea what Bokeh was until I read this. I’m equipped with a Nikon D90 camera and am looking for a lens to create that Bokeh effect as you have mentioned. I seen that you recommended a Nikkor 50 1.4G lens that has great results. Would this lens also be good for full family shots at an adequate distance. I’m looking for a LOT of blur (Bokeh). Not just close ups. Good stuffs Mr. Nasim, … a couple of emperical notes from a Photosaurus Lensii dinosaur. Cameras do not affect Bokeh. It’s all in the lens and the aperture. Most lenses can be coaxed into reasonable Bokeh by shooting at wide open. Depth of field will be shallowest, and if the diaphragm blades are competely out of sight during exposure you’ll be shooting through as close to a circular aperture as you can get. Naturally, the longer the lens the easier to establish the necessary shallow depth of field. As Mr. Nasim mentioned, lenses with the more modern rounded aperture blades will help “circularize” the aperture when stopped down for exposure. circle in the center of the front “element.” This yields that characteristic “donut” Bokeh that is very distracting from the in-focus subject. The other is more subtle and may change as a lens is stopped down. This is most likely seen in zoom lenses and/or lenses with a huge number of elements. Many modern complex still camera zooms and especially modern cine lenses can show it. This Bokeh is characterized by a circular out-of-focus disc, but the variation in evenness of illumination of the disc can result in either a brighter disc center, or a brighter ring toward the edge of the disc. Some lenses go from one condition to the other as they are zoomed or stopped down. Always good to check Bokeh at shooting aperture before exposure until you learn the lens’s Bokeh characteristics. Ain’t lenses Fun? Enjoy the playground! Nice article, but not complete. Of course, the quality of the lens makes or breaks a picture, and some lenses have a much nicer rendering of the image than others. And the best lenses make pictures which seem 3-dimensional. But, Bokeh is primarily a function of the shape of the diaphragm; the more it approaches a perfect circle when stopped down, the better the bokeh. The most contrasting bokeh you’ll be able to see is when comparing a picture made with a mirror lens and a ordinary – long – telephoto lens, of which the focal length IS the length of the lens itself (so no retro-focus). The Novoflex (Jos. Schneider) and Telyt (Leitz/Leica) lenses are such telephoto lenses, for instance..
how can i get heart shaped bokeh.? A couple of suggestions. I didn’t read all the comments so these may be redundant. One way of getting even more isolation and less depth of field is by using an extension tube between the lens and the camera and the longer the lens the more blur or bokeh as the new term is. You can cut a heart shape in a black piece of paper and tape it over the front of the lens. You can experiment with sizes and other shapes. Interesting article and great overall descriptions. One problem that might be a point of confusion was the statement, “for example, the Nikon 85mm f/1.4D lens produces exceptionally good-looking bokeh, while the Nikon 18-135mm f/3.5-5.6G DX lens produces poor bokeh at the same focal length and aperture”. A Nikon 18-135 f/3.5-5.6G is not capable of reaching the favorable aperture of the Nikon 85mm f/1.4D, it isn’t that’s a poor lens, but you cannot compare it to the 85mm @ f/2.8 for example because it’s not even capable of such a setting. because a blurry background doesn`t always have a bokeh appeared. For example : if u shoot the blue sky with focus lens in closest distance, the sky will be completely blur.. but are there gonna be bokeh ? NO.. Thank you so much for making this blog. I’m getting into photography as a hobby and this website is amazing. You do a great job explaining everything!! is nikon 50 mm 1.4g compatible with nikon d5300? Great article especially for beginners, I’ve been an addict of trying to capture time visually since the 70’s. I know there are a lot of lens/camera brands out there now, but a little surprised no mention of Leica. Is there any camera feature to look for in order to capture the Bokeh with a point and shoot camera? From the comments above and my past experience, it seems that cameras witha “macro” mode, particularly if the camera automatically moves to it, are the best bet. I recently got a new point and shoot (Canon ax 610) that does not do this and am finding it frustrating. Do you know anything about if/how smart phone cameras have the ability to render these focus/blur choices? A great article explaining BOKEH in detail with simple terms with examples, to professionals as well as to enthusiasts. Great post and information – many thanks! I bought my Nikon D600 online in 2013, which came with the Nikor 28-300mm 1:3.5-5.6G lens. Sadly, I didn’t do enough research prior to purchasing and wondered why my architecture photos had so much distortion. I discovered that the wrong lens was sold for my D600. An expensive mistake! So now, I find myself looking to sell my Nikon lens and find something with an equivalent focal length for my D600 but without so much distortion! I am very much pleased with your each article. As I am new to this photography world with DSLR so do not have depth idea of it. But your articles really helping me out. In brief I have one concern as I have basic kit lens of 18-55mm of canon 700D. But many of my friends are saying to buy other zoom lens of 55mm-200mm for better bokeh and even for better portrait pictures. so can you please let me know is it necessary to buy another lens of 55mm-200mm just for good portrait images?? or should I buy prime lens of 50mm f1.8 which is capable of giving best bokeh and even portrait images and neglecting the idea of buying extra zoom lens of 50mm-200mm which is little costlier than prime……..
please help me out if you can. Thanks so much for your clear explanation of the bokeh. Now I need to get a new prime lens in addition to my two zoon lenses! Very much like th pictures you’ve included to make your point! Cheers! I own a d3300 with kit lens as well as 55-200 from Nikkon. I’m an aspiring photographer, love doing landscapes but would love to start portrait (studio) photography. I really care about a good bokeh and bright pictures. I just bought a Nikon 50mm 1.8 G. Can you advise me what other lenses I can get that will produce best results with my D3300, before I have a chance to go pro with a FX camera ? Best lenses for indoor and outdoor people photography that will have professional quality to the images since I’m looking to get into paid photography. Hi there! So I recently bought a Fujifilm x-A5 with 15-45mm and f3.5-5.6. They say that it’s good for beginners. I wonder how I can maximize it’s use given its lens and aperture spans. Thank you! I recently found a used Tokina 500mm f8 mirror lens and after some fiddling with my Pentax K5 to make them work together, it’s a marvelous lens for producing bokeh. Very smooth indeed! Doing floral or such reveals a buttery background which really works for me. Hi, so good bokeh is mix of sharp and not sharp, so both should be separate, for best bokeh, the more sharp at center, the more blur at outward, the better the blur, the better your focus to center, which you say bad bokeh is distracting you. So, what do good and bad bokeh depend on what? It is ratio of F, and so on? The more you absorbs the light, the more it reflects outward from your eye to result of an imagine, so that imagine is sharp. So, outward as the light spread out, same as sun itself, the further you are from the sun, the lower heat you feel, the lower intensity you see from the sun, and the smaller the sun you see, so the blurry increase. So, it doesn’t depend only by ratio of F, but also depend by iso, how much light you increase that interact external light with internal light that is iso? There is light in camera that increase or decrease, to cause good bokeh or bad bokeh. It is about balance of ratio of two light to cause good or bad bokeh? So, camera is about knowing how good the zoom, and how good is ratio of contrast of two, the most sharp to the most blur, which the center that absorbs your attention is details, and the most blur outward is lowest details, so the details itself expand, so like two light that overlap, so it blurs, so the more it overlaps, the more the blur, the more lowest details and the more opaque, not transparent. It is ratio of opaque to transparent. Zoom depend on F, good blur depend on what? ISO? Or combine of both?? So, two things is important for camera is zoom and good bokeh, when you have good bokeh, the center will be the most details and you can see more, right. So, it is connect to resolve. So, bokeh is result of imagine that connect to resolve, the process. It depends on light itself and combine of two light, external and internal. So, it is not just external light, but external and internal light that blend well?